As much as I hate economic downturns, I also love them for what they force Las Vegas to do. It was the recession of 2001-02 that kicked marketing towards gays, Latinos and women into high gear, and this desperate go-around they'll take absolutely, positively anyone. Finally, though, Harrah's is changing all that. 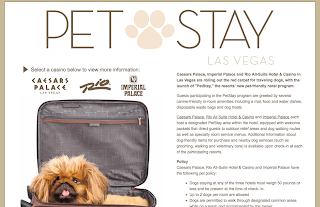 Starting today, Caesars Palace, Rio and the Imperial Palace have some pet-friendly accommodations. For $25 a night at Caesars and $20 a night at the Rio and IP -- extraordinarily good deals for anyone who has ever boarded an animal -- you can bring dogs under 50 pounds. They allow two per guest and you can walk your dogs through "designated common areas" on a leash. What a terrific idea at a sensible price. And, according to the site, they even provide a mat, food and water dishes, disposable waste bags and dog treats as well as information about where the outdoor "relief areas" are and information on nearby vets and groomers. Had Caesars had this two weeks ago, we almost certainly would have stayed there. As you can see, we are very attached. So, why the weight restriction of 50lbs? What do you think the reason for that is? That's pretty common from what I see from other hotels that accommodate pets too. Obviously, that excludes a lot of people's pets. Is it merely a size thing or is there something more to it? At least they don't discriminate by breed, that would really piss me off. Lastly though, some hotels claim this and don't deliver as promised - so I don't know if I'd want to be the first person to try this out. This is a good start. Vegas is missing out on some possibly very profitable national dog shows because hotels are not pet-friendly. For example, I'm involved with Doberman rescue (www.drnv.org) in Vegas and our national group just completed its annual national show... in TOPEKA. Yep, Topeka was more friendly than Vegas even though people ask every year why the club can't come here. I hope that changes. They're not doing themselves any favors with the 50 lb. limit. A Great Dane is going to be a much better guest in a hotel room than a Jack Russell. Whether a dog is appropriate for a confined space, such as a hotel room or a city apartment, has very little to do with the size or weight of the dog. Still--good for Harrah's for figuring out that being pet-friendly is good business, even if they're going about it the wrong way. Observation No.1: They call it "Pet Stay" but it's just for dogs. Observation No.2: You know, I always was sorta opposed to this thing for the kind of parasites/critters that live on some people's pets, but given the bed bug situation of the past few months I guess it's not too bad.